One only has to glance at Matt Sewell’s collection of illustrations, canvasses and wall art to know that this is an artist with a penchant for the most vibrant and colourful of designs. It’s indicative of his music choices as well, since Sewell has been lucky enough to have the chance to make his very own music compilation (as well as design his own gatefold vinyl sleeve) for Caroline True Records. What a kaleidoscopic listening pleasure ‘A Crushing Glow’ is too. Parsley Sound’s ‘Twilight Mushrooms’ is a perfectly pastoral way to to begin. Full of dream-like harmonies, sunny guitars and an even sunnier outlook, the late 1960’s psych-pop vibe serves as an introduction to both a largely unknown band and the “voyage of musical discovery” which is promised. The atmospheric quality continues thanks to Luke Howard’s wonderfully fragrant ‘Portrait Gallery’ and The Durutti Column’s ‘Otis’; one of the sweetest and most moving tracks from Vini Reilly’s prolific and brilliant career. In a strong middle section, Ashra’s ‘Slightly Delayed’ imagines a progressive version of Kraftwerk’s ‘Neon Lights’ whilst the superb Lobt Noch Irrt contribution, ‘Heizgas Meter’, begins with extravagant keyboards and thick beats but ends with evocative passages of nocturnal longing. Although an admirable level of attention has clearly been invested to ensure there’s a seamless flow from beginning to end, the music loses its urgency somewhat on the predominantly Eastern-flavoured final section but even here the meditative quality of the contributions from Popol Vuh and Saddhu Brand almost guarantees some very sage nodding of the head. 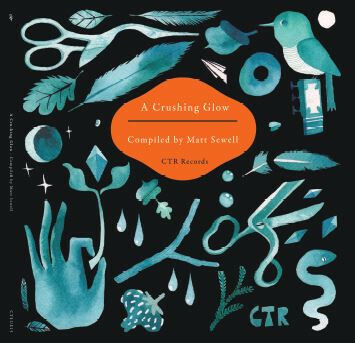 ‘A Crushing Glow’ is a vibrant, expertly-selected compilation which does much to reflect Sewell’s cosmopolitan and spiritual tastes. There’s creativity aplenty and – at the very least – curious listeners will be frantically Googling for more information after hearing some of these largely obscure acts for the first time. Singing like willowy girls whilst dazzling with some space age pop, Lisa Masia and Marina Cristofalo were certainly right on the money when they named their band Lilies On Mars. Having also added to their growing reputation with a song named track of the week on Simon Raymonde’s Amazing Radio show and earning heaps of praise for ‘Dot To Dot’, these are exciting times for the duo who spend their time recording in both England and Italy. Early impressions suggest Lush fronting Stereolab thanks to the spooked-out girl vocals and retro-futurist arrangements but they actually end up sounding more ethereal than both on the chillingly atmospheric opener ‘See You Sun’. Great invention is at the heart of this record as ‘Dream Of Bees’ glistens in its shimmering 1960’s pop setting, ‘No Way’ profits from vintage keyboards and ‘SIDE ABCDE’ all present the kind of experimental, electronic pop which shows these ladies aren’t just another dream pop/shoegazer act (even though they could fulfil this task and still make a very good album). Whereas some revel in the nostalgia in vintage dream pop, Lilies On Mars are pushing further with their ambition, bringing in new influences and genres into their already complex songs. 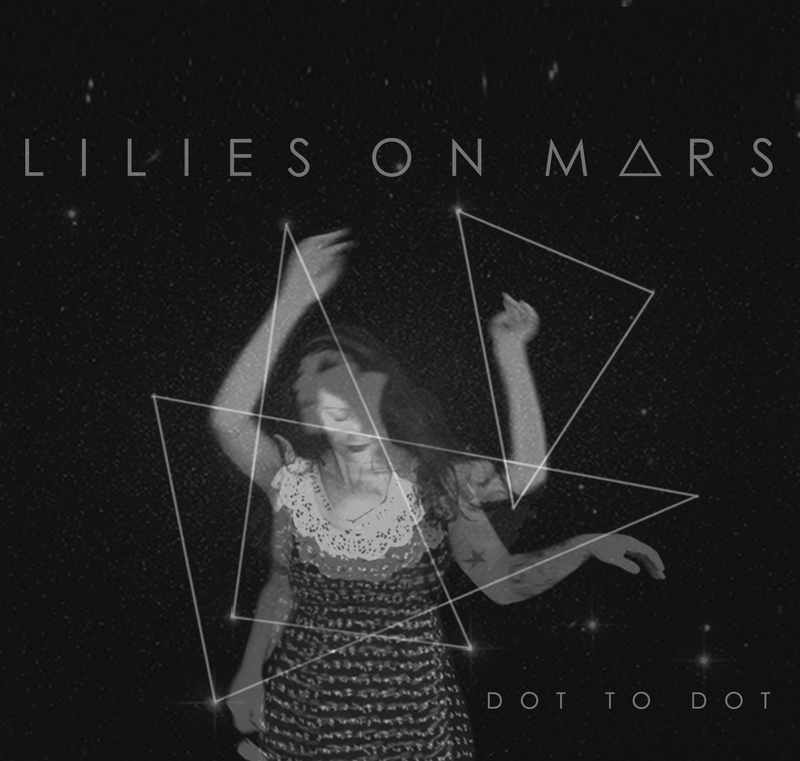 Not everything works perfectly but Masia and Cristofalo largely succeed in their request to offer lunar pop melodies and on just ideas alone Lilies On Mars are an exciting band to keep your eyes on. People deal with death in so many different ways and although there have been many examples of musicians making the best use of their talents as a form of emotional release, it’s hard to imagine just how difficult it must be to put pen to paper or finger to key and create a piece of music which not only provides catharsis for the creator but also develops a listening experience that can be appreciated by a complete stranger. The latest album by Black Walls, the solo work of Canadian Ken Reaume, is a prime example of such an experience. Reaume recorded ‘Communion’ from his bedroom at night, aided and abetted by his solitude and memories of a deeply religious upbringing. Throughout the record, certain aspects are presented just like one would expect. So the pace of the album is unsurprisingly funereal and the mood is largely bleak. The music itself features drone and those impressions of black walls are immediately brought to life in vivid detail thanks to Reaume’s usage of reverb and dark effects. Words are kept to a minimum with Reaume repeating the line “fall asleep for years” on the opening title track; his own soft vocals acting as a calm, almost soothing balm against the inescapable and understandably elegiac arrangements. At the centre is ‘PTSD’, where the only human voices are sequences of ghostly moans as the speakers throb under the sheer weight of the doomy textures. ‘Funeral/Wake’ is another instrumental production and possibly the most elegant and beautiful moment on the record; its twelve minutes of modern classical majesty swelling and subsiding in a powerful but never overpowering manner. Yet put all these bleak layers together and the sum effect isn’t one of depression. ‘Communion’ could have been tortuous but Reaume fills these pieces with space and there’s an uplifting feeling generated by the outpouring of emotions and melancholic grace showing that there is a chink of light at the end of all the suffering. The subject matter is afforded dignity and respect, with the largely wordless approach being more fitting and appropriate than any generic hymn which comes to mind. It is a privilege to hear ‘Communion’. Barcelona’s Jordi “Maiki” Rivora first appeared on my radar with some idiosyncratic electronica and an intriguing selection of inventive covers of material from Robert Wyatt, (Luke Haines project) Baader Meinhof and Talk Talk. 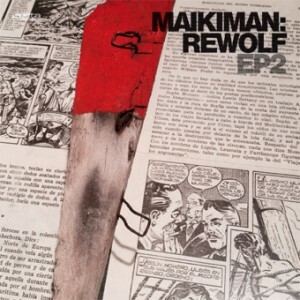 For the two ‘Rewolf’ EPs here, though, he has dispensed with eccentric versions of others’ songs and instead crafted six entirely instrumental tracks under his Maikiman identity. The first EP is very much a beat-heavy affair. In fact between 120 and 130 beats heavy per minute if we’re being more specific. The first piece, ‘One’ (each is titled according to its sequence) begins as primitive and minimalist electronica, with the track bringing in new layers of instruments with each passing minute, including passages of sonic squiggles, drums and persistent drones. By the end of its ten minute length, I was left thinking of its resemblance to the French coldwave/post-disco act Colder. The second track is even more austere but mesmeric in its own detached, robotic way. Then, in a belated concession to humanity, “Three” brings in warm bass throbs and melodies suggesting early Kraftwerk. Even though “Four” is the next piece to follow, it is clear to see why this is part of a different EP. For a start, there is the obvious fact that they were produced four years apart but they differ wildly in approach too. ‘Four’ is multi-textured and consists of macabre ambient movements, samples of child voices and insistent beats suggesting Boards Of Canada rather than any Teutonic influence. ‘Five’ is a more abstract offering populated by somewhat random effects but there’s an underlying, enigmatic tune and rhythm which holds the listener’s interest whilst “Six” takes us to the streets with samples from what appears to be a busy city at night time but the atmosphere is soon usurped by slabs of rather brash techno. Compared to past releases it could be argued that Rovira has toned down his maverick tendencies a little and as a result some of these tracks don’t bear his usual trademark. However, on the second EP in particular, Rovira begins to make his mark again, with machine music tailor-made for lonely nights. 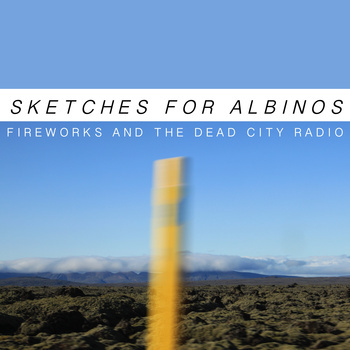 Sketches For Albinos is a nom de plume used by composer Matt Collings for one of his many side-projects. The tracks here are intended to signify a time in Collings’ life “where euphoric joy and devastating sadness collided”. The feelings evoked tend to veer towards the latter than the former but ‘Fireflies And The Dead City Radio’ is definitely an album which demands a period of concentrated listening to appreciate its true worth. At once it is possible to recognise this is the work of Collings as certain commonalities exist between his solo album ‘Splintered Instruments’ and the recent long player by The Graveyard Tapes. Layers of ferociously strummed guitars and frantic piano characterise ‘I Have So Many Things I’ve Always Wanted’; the effect is akin to being helpless on board a runaway train. ‘I Think We Grew Again’ is even more disorientating, as what appears to be a collapsing drum kit is merged with haunting ambient minimalism and snatches of dialogue. As the album plummets further into the darkness, ‘February With The Wolves And Angels’ increases the chill factor with a sea of alien noise and public information samples, then seguing to the distinctly shoegaze-flavoured walls of ‘Submerged Cathedrals’ and a beautifully fragmented and desolate ‘The Sailor In The City Is Buying Up Time’. By the end of the record we have also heard what could have been recorded remnants from Talk Talk drummer Lee Harris (on ‘She Drew A Pentagon) whilst ‘Piani Fingers’ throbs and distorts its way to a sombre and eventually restful end. Once again Collings proves his worth with the latest in a spate of releases bearing his name. The moniker this time may suggest these are extra tracks which weren’t deemed to be worth of inclusion on other recordings but that is obviously not the case and instead Collings merely emphasises his skills with creating an experience so appealing and dynamic from something which should sound so dissonant. Francis M. Gri has impressed on past releases for his own label KrysaliSound, most notably with last year’s ‘Ghost Dreamers Town’. 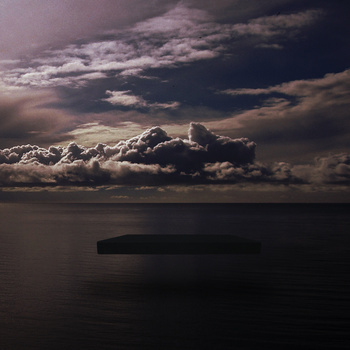 It was an ambient/post-rock album which kept an insistent melodic and rhythmic flow throughout. For revglow, the outlook is very similar but here Gri’s instrumental reverie is augmented by female vocals from fellow Italian, Lilium. The opening ‘Scars’ is a curious assembly of ghostly female vocals, drum and guitar loops which seems to drift pleasantly by until, after two and a half minutes, the track unfolds into a sequence of hypnotic synth patterns which usher in the soulful singing of Lilium for the first time. ‘Strangers’ is blessed with similar heavenly layers of sound and whilst it may fall into the sphere of dreampop, its roots can also be found in ambient music. An unexpected double bass introduces ‘Phantom Theatre’ but more captivating still are its subtle but relentless rhythms and beats which combine perfectly with the breathless vocals. This juxtaposition is the key to the album and it can be no coincidence that on its best moments, the urgency of Lilium’s delivery is matched by Gri’s complex arrangements. For ‘This Is The Day’ Lilium resembles a lost siren trapped within walls of shifting beats and ringing guitars and this impression is given further credence on the excellent ‘Seagulls Choir’; one of the more understated tracks which revolves around desolate piano and Lilium’s valedictory cries. Admittedly, some momentum is lost towards the end of the record, most noticeably on the lighter than air ‘Self Portrait,’ but otherwise this is a deep and moving listening experience. In conclusion, ‘Sound Post Tension’ presents further evidence that Gri’s KrysaliSound empire deserves far more prominence. ROSïE Henshaw has a colourful backstory having being educated at a boarding school in the Himalayas, then moving on to the contrasting lifestyles of Hong Kong and Australia, where she now resides. Presented as a chanteuse, songwriter, multi-instrumentalist and free spirit, Henshaw sets her sights on an eclectic vision to match the cosmopolitan upbringing too and for her first album she is backed by an equally versatile and talented band made of members beginning with the letter “B”, hence the rather catchy “Bees” moniker. The Sun’ gives an early indicator of Henshaw and co’s jazz and psychedelic soul backgrounds. For an opening track it’s a brave start since the song eschews the most obvious verse/chorus structure with Henshaw keen to demonstrate this is very much a band effort. Elsewhere there’s a plethora of styles and instruments to enjoy from rapping (for the loose-limbed, freeform ‘You’ and ‘Jasmine’) to sitar-led numbers (‘I’ll Sail My Ship’) to some lovely soulful harmonies for ‘Let There Be Love’ and a bonus song about avian faecal matter (‘Birdshite’). So something for everyone really. Occasionally, as on the wayward ‘Bubble’ or the overlong ‘In The Scheme Of Things’, the free spirited nature of the music threatens to undermine the songwriting but the band and their laidback approach are still a pleasure to listen to. However, setting aside the ambition and experimental nature of the record, Henshaw and co. are actually at their best when performing music which falls into the category of “pop”. ‘Sunshine Soldier’ is simply a joy from start to finish from the languid summery guitar refrain to the inventive keyboards and Henshaw’s pure gold vocal. Then there is ‘Music’ which soars from its liquid funk foundations to its vibrant arrangement; it’s like hearing an Australian version of TLC’s ‘Waterfalls’ and it’s every bit as infectious. If ROSïE and her band can control their occasional waywardness, we can expect a brilliant concise album from them. 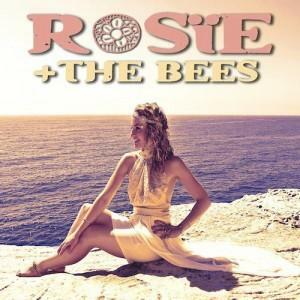 So this album isn’t quite as good as it could have been but when ROSïE and her busy bees are good they are so good, it’s hard not to listen to these songs without raising a smile and feeling like it’s Summer even during the coldest Winter..